I always try to go to the lunches that support the research of various cancers, those that support pound puppies, the ones that are in favor of a political candidate I support – however Friday was a new one, even for me. I was invited to attend the Poultry Festival Ladies Luncheon – or rather the Ladies of Poultry, which I like better because it sounds like it should be a calendar – next year for sure. 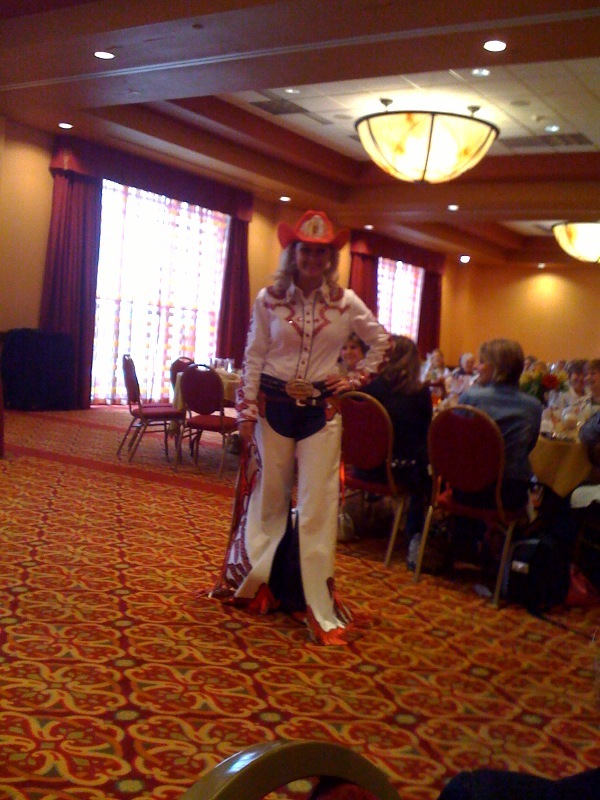 One of the finer outfits was this – a full on Rodeo Queen get-up with sequins Razorbacks on the chaps and the back of her shirt, I’m heartbroken to say I have no picture of the back of this. i feel like I was IN THAT very same room? Or do all hotel rooms look the same?